NT30NW 12.01 3417 0776 RR 3. 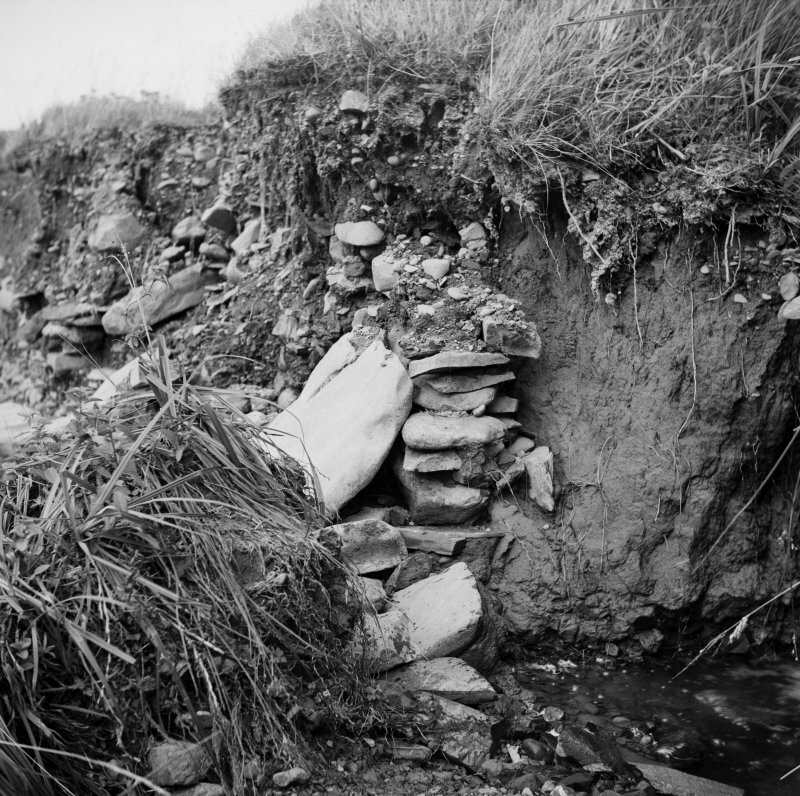 The remains of this stone-built road-culvert were exposed by flooding in August 1948. Embedded in the left bank of the Borthwick Water midway between the lower end of Northhope Haugh and the enclosed fields of Craik the culvert, of which the NE side and the bottom survived when first found to a length of 14 ft, was of rectangular section and measured 1 ft 5 in in height by about 1 ft in breadth (Figs. 610, 612). Erosion had evidently removed an unknown length from its SE end, and a further 3 ft had disappeared at a subsequent visit. The side is neatly built in thin, hammer-dressed masonry five or six courses high and the bottom is of thin flags; remnants of the SW side and of the cover-slabs can be seen lying in the stream. Fig. 610 further shows a vertical step in the upper surface of the underlying natural gravel about 18 in beyond the left-hand edge of the stonework; this is clearly an artificial feature, most probably the vertical end of the construction trench dug for the building of the culvert. It is clear that the purpose of the work was to lead a small and still existing runnel of water underneath a roadway which was more than 14 ft in width; and remains of the road itself are to be seen in a patch of substantial and homogeneous bottoming, closely packed with clay, which appears above the middle of the culvert. This bottoming shows the clearest signs of having been heavily eroded by the Borthwick Water before the deposition on top of it of some two and a half feet of washed sand and gravel; and it follows that the stream first eroded the work and then covered it with alluvial deposit before cutting for itself the deeper channel in which it now runs. This speaks for the high antiquity of the feature, which is itself a structure belonging to an engineered road and so common on Roman roads as to call for little comment. No trace of this culvert could be seen. It has evidently been washed away by the Borthwick Water. 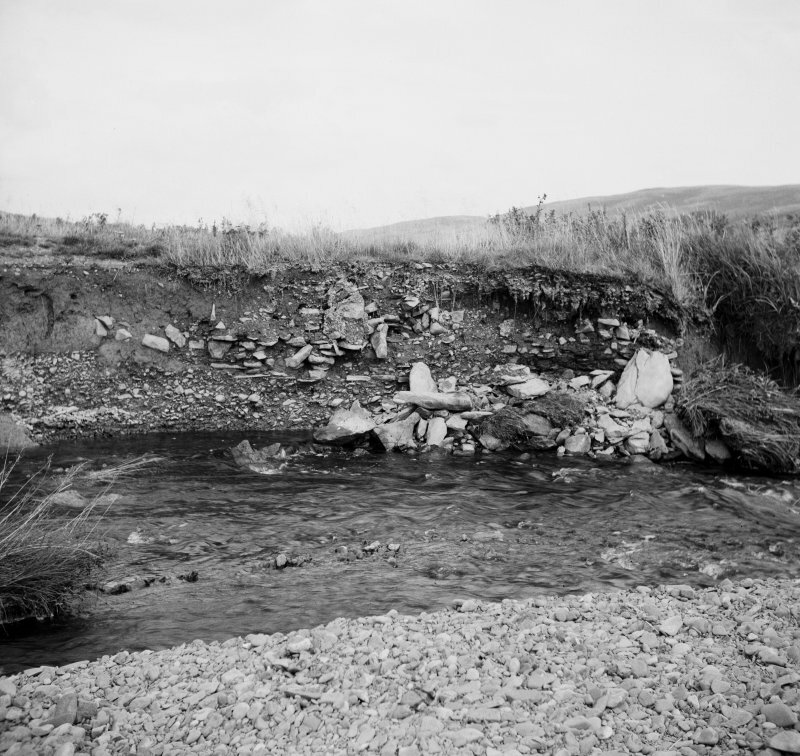 Its site was fixed at NT 3417 0776 from RCAHMS photographs (figs. 610, 612 in Inventory). Visited by OS (WDJ) 23 July 1962.